Line a 13x9x2- inch baking pan with Reynolds Wrap® aluminum foil. Combine honey, mustard, butter, Worcestershire sauce, salt and pepper; set aside. Rinse any ice glaze from frozen Alaska Salmon under cold water; pat dry with paper towel. Place salmon portions in center of foil-lined pan. Arrange asparagus around salmon. Sprinkle with walnuts; drizzle with reserved sauce. 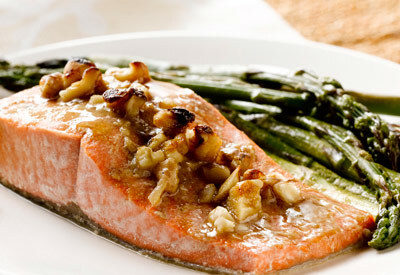 Roast 26 to 30 minutes for frozen salmon or 20 to 22 minutes for fresh/thawed fish. Cook just until fish is opaque throughout. Cook's Tip: For best texture, select thinner asparagus spears when cooking with fresh/thawed fish or thicker spears with frozen fish.